Every time we boot up our computers we see a boot up screen that covers the codes that the computer is running to load the operating system. When we get to our log in screen we see the users and we write our passwords, instead of writing our usernames and passwords on a black screen with green letters. When we finally load our desktop, we don’t have to write lines of codes to do things that now might seem easy, like opening a document, instead we click twice on the document we want to open. All of this is possible thanks to something called the GUI, the Graphical User Interface. Anything we see on our computer is either in the form of an icon or text which we can access by double clicking on it, unlike on earlier computers where you would have to write the file’s position in your computer’s disk drive and run a command to open it. The GUI was one of the best inventions for the use of computers because it makes everything simple to do and a lot quicker than it used to be. The first idea of a GUI came from Vannevar Bush around the 1930s when he described a device he called Memex made up of 2 touch screen surfaces that resembled a desk with a keyboard and a scanner that worked along with it. Of course we didn’t have the technology to make such a device back then, but as the years went by the concept evolved into what we see and use today. The first ever GUI was made by Douglas Englebart, after receiving fundings from the United States Air Force he held a public demonstration, in 1968, of the NLS or oN-Line System. 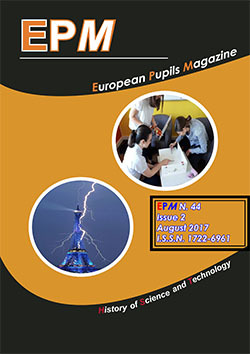 The NLS was hooked up to other computers which makes it an online system of computers working together, but this device showed vector graphics and text on the same screen, although only uppercase letters could be shown. To use the NLS Englebart worked on 3 different input devices, a keyboards, a box with 3 buttons which will become what we call a mouse, and a chording keyboard. 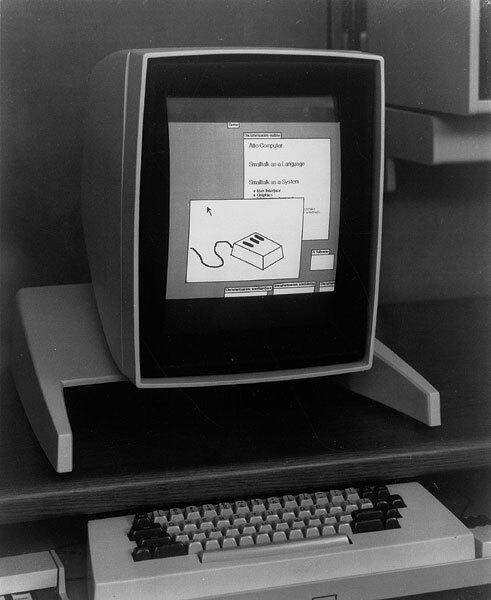 With the mouse he created, Englebart navigated through the display of the NLS just like we do with our computers nowadays. This project was taken over by a well known paper and photocopiers company: Xerox. 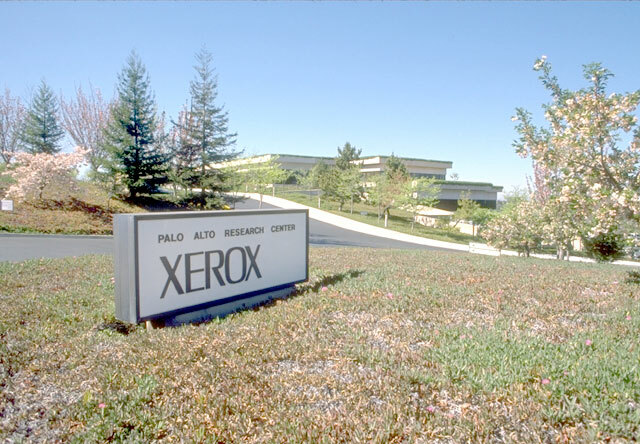 Xerox created the Palo Alto Research Center, or the Xerox PARC, where the Alto was created in 1973. The Alto was a computer that used a paper-sized display that was used to show contents that would be printed from a laser printer, which was another of their inventions. The GUI used for the Alto was only slightly graphical and rudimentary as there were no “windows” as we know them today and it was quite plain. The Xerox PARC then realised that they would have needed a better environment to run new applications, an environment that would have become Smalltalk. Smalltalk was an object-oriented programming language created in 1974, but it was also a program that you launched directly from the Alto and that took over the whole environment it was running on. It was made up of separate windows that could be stacked on top of each other, icons, popups for the menus and scroll bars to scroll through pages. While the Alto didn’t become a commercial product, Xerox made another model in 1981 marketed for $17,000, the Star 8010 with a stripped down version of the Smalltalk system. In the 1980s most systems started using GUIs, with many companies designing their own for DOS, Atari and Commodore 64. One of the first GUIs was VisiOn, a very costly and highly text based interface that used mainly text instead of icons. The whole experience was quite clunky since it used a monochrome screen and demanded high specifications for it to run. Tandy Deskmate was a GUI bundled with Tandy PCs in 1984, it used shortcuts through keyboard combinations to navigate through the menus. In 1985 GEM was created as a GUI for DOS and Atari’s ST. GEM was so similar to Apple’s GUI that they ended up getting sued by them so the distribution of GEM for DOS ended although the version for Atari’s computers continued to be sold. The Amiga Workbench was another GUI made for Commodore’s computers, it brought some innovations to the system like being able to move windows throughout the stacks and being able to work on windows that aren’t at the top of a stack. GEOS was a GUI for older computers such as the Commodore 64 and the Apple II, it didn’t require high specs and it looked very much like GEM’s GUI. In 1987 a company named Acorn started marketing their computers equipped with Arthur, their own personalised GUI, it ran in 16-colours and had a new feature called “Dock”. In the dock you could put application shortcuts much like we do today with Window’s task bar and Mac OSX’s Dock. In 1985 Steve Jobs left Apple after some controversies and founded NeXT, which will make one of the best GUIs available at the time. With his new company, Steve Jobs started competing directly with Apple and all the other computer manufacturers but also with Microsoft which already made their Windows system. NeXTStep was a very modern and advanced System with a GUI that throughout the years and with Steve Jobs controlling the project became an interesting investment for Apple. 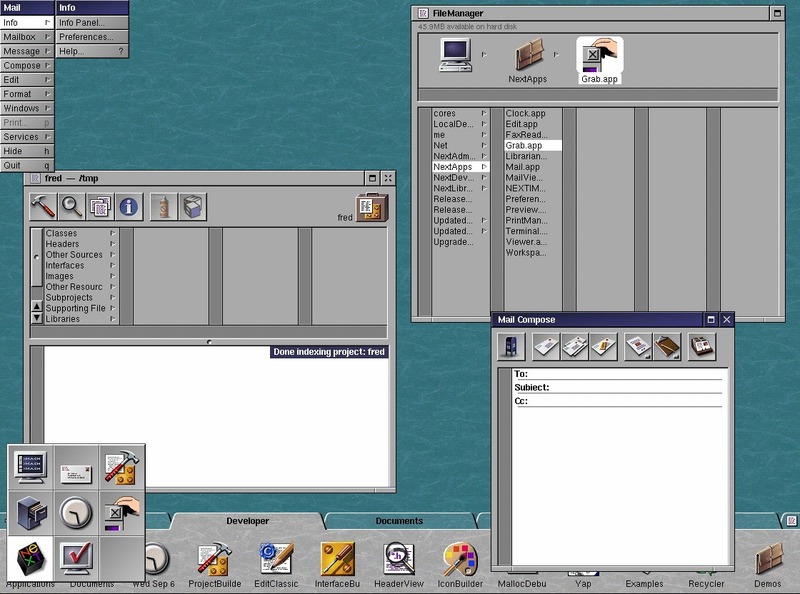 In it’s later versions NeXTStep became a versatile system that could communicate with almost al the major networks and their systems, it had fast graphics that could redraw windows without having to wait long loading times, it had a very easy to navigate file system and it featured a dock that could stay on the sides of the screen. NeXTStep was so well built that Apple decided to buy NeXT and incorporate it into their next system. When Steve Jobs, co-founder of Apple Computer in 1976, visited Xerox PARC and saw Smalltalk he was convinced that GUIs would have been at the base of the future of computing. What he saw along with other Apple employees changed what the Lisa, their next generation of computers, was going to be as it was first conceived as a text based command line computer. The Lisa became a graphical computer, but it never became very popular when it was released in 1983 for two main reasons: it was priced at a steep $10,000 and it was difficult to write software for the new system. Some of the breakthrough characteristics of Lisa’s GUI were the use of icons for documents and applications, pull down menus at the top of the screen and keyboard shortcuts for the most used commands. A trash can was also added to delete documents and the mouse, which originally had 3 buttons, 2 in the Xerox Star, now only had 1 button in the Lisa, was used to navigate through the interface, and for the first time the idea of double clicking to open a document or run an application was created. “Drag and drop” was another creation used in Lisa’s system along with launching the application that opens a certain document by opening that document. Steve Jobs was the head of the Macintosh project at the time, his goal was to create a computer that had a low cost but high commercial impact with most of the features introduced with Lisa. The Macintosh was a real success, with a price of $2,495, a 9” monochrome screen, 128K memory and a floppy drive it soon became a hit. Since the Macintosh 128K has little memory the Operating System had to be rewritten but Macintosh System 1 shared some of the base codes with Lisa’s system. The Macintosh System GUI remained quite similar up to System 7.0 which came in colour and introduced some graphical changes. PCs while knowing who made the system. which brought the NeXTStep GUI to Apple’s programmers. The new interface “merged” with Mac OS 9 and was introduced in a public beta as Mac OSX. The system’s look and feel radically changed thanks to new UI elements such as Aqua and the brushed metal look on the windows. It also brought some graphical eye-candy like animations when minimising and maximising windows. While newer versions of Mac OSX up to it’s 5th release kept the GUI looking almost identical, Mac OSX Leopard (10.5) introduced more eye-candy and deleted some of the Aqua interface. The deletion of Aqua continued in Mac OSX Lion (10.7) where there are only a few aspects of Aqua remaining. Other changes that can be noticed in these latest versions of the system are the loss of coloured icons while moving to the brushed metal look. When Microsoft created Windows 1.0 it was originally going to be called Interface Manager, it was a cross between a GUI called VisiOn which was a very costly and highly text based interface, and it’s Microsoft Word for DOS. Windows 1.0 came to the market in 1985, it was in colour and resembled Macintosh System 1 in many ways. Microsoft worked closely with Apple to make some of the first applications for the Macintosh so they could have been influenced by the Macintosh’s GUI at the time. While Apple did not sue Microsoft for Windows 1.0, they did sue them for Windows 2.0, it looked and worked more like Macintosh’s system more than it did in it’s earlier version so Apple took the case to court but because of previous agreements with Microsoft, the latter got the benefit of the doubt and won the case. With Windows 95 Microsoft took the lead in the Operating System race and it became the most popular GUI. Microsoft didn’t make many changes in the next few versions of Windows until in 2007 when Windows Vista debuted with its new interface: Windows Aero, although it was blatantly inspired by Apple’s own GUI. The next version of Windows has been in development for a while and one of the new characteristics of the system will be a new and original GUI made to work well with tablet computers that looks more like the mobile version of the system. When Microsoft created Windows 2.0, Apple decided to sue the company for their GUI. Windows started out as the office suite we know as Microsoft Office and was one of the first programs to be written for the Macintosh. When Bill Gates threatened to cancel the project he requested some of the Mac UI to be licensed to Microsoft to be used in MS-Applications in the PC environment and that Apple cancelled its own office suite project for Macintosh. Apple could not lose Microsoft’s help so they granted these requests but this helped Microsoft win the case in court when Apple claimed 189 patent infringements. When Windows Vista was published Apple also criticised the way Microsoft took Apple’s design and used it in their system but it all seemed like a joke. Many fan boys make comments regarding the various similarities between Microsoft’s recent UI changes and PC users often justify the resemblance saying, just like Bill Gates once did, that Apple copied from Xerox. That statement is not true as Apple did not copy the Alto’s GUI or the Smalltalk language, but created their own GUI and programming language basing them on what the small team from Apple saw during their visit to the Xerox PARC. Steve Jobs also paid for the tour in the Xerox PARC by giving Apple’s stock to Xerox and later hired some of its programmers to work for Apple. As the various GUIs evolve throughout time we continue adapting to different ways to interact with software and hardware. In the past few years we’ve seen the rise of smartphones and tablets that use multitouch surfaces, making interactions with the devices more straightforward but demanding new interfaces that work better with gestures. Soon we might even find GUIs being developed for 3D spaces, a concept which could be implemented in holographic environments or, less probably, movement aided camera views when going through different UI objects. The GUI is definitely a recent creation and it still is a reasonably new concept, but in its brief history we have seen though this article it has changed in many ways and it will continue to do so for a long time.